Foam Chief Wahoos line the shelf at the Cleveland Indians team shop in Cleveland, Jan. 29, 2018. Divisive and hotly debated, the Chief Wahoo logo is being removed from the Cleveland Indians' uniform next year. The polarizing mascot is coming off the team's jersey sleeves and caps starting in the 2019 season. The Club will still sell merchandise featuring the mascot in Northeast Ohio. The Cleveland Indians baseball team has gradually dialed down its use of the cartoonish “Chief Wahoo” logo in recent years. On Monday, Major League Baseball said the team will stop using the logo on its uniforms and at its stadium in 2019. It’s about time, but Cleveland shouldn’t stop there. In an interview with The Plain Dealer newspaper last week, team owner Paul Dolan continued to downplay concerns about Chief Wahoo, and the team’s name, which he said is not going anywhere. “Yes, some people will continue to make noise about that, but I’m not troubled by its use,” he said of the Indians name. 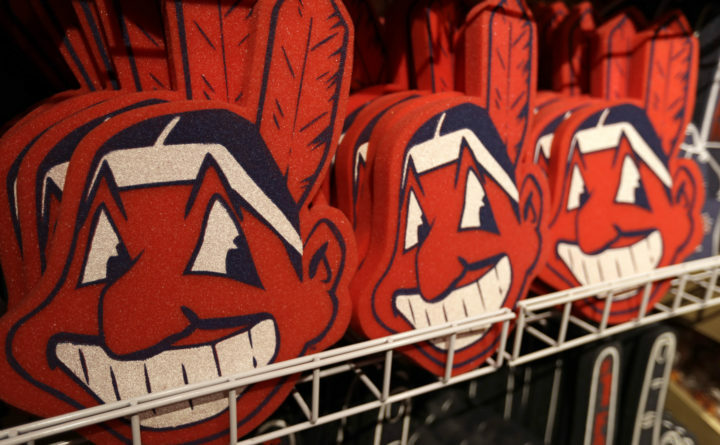 He also talked up the community’s longtime affinity for Chief Wahoo to explain why merchandise with the offensive logo will still be sold by the team. These are the wrong standards. Schools across Maine and the country have abandoned team logos and names offensive to Native Americans over the years. They’ve recognized that, even if a vocal contingent of fans claim it honors Native Americans, it’s more important to eliminate a name or logo that those whom it depicts find personally offensive. The Cleveland Indians should therefore change their name and completely eliminate the use of Chief Wahoo as well. The Chief Wahoo mascot dates back to 1948, the last time Cleveland won the World Series. Neither the team name nor its logo has its origins in respect for Native Americans. The same can be said about the team’s name. “In place of the Naps, we’ll have the Indians, on the warpath all the time, and eager for scalps to dangle at their belts,” the Cleveland Leader wrote in announcing the name change in 1915 — a sign that respect for Native Americans wasn’t the idea behind the name. Decades later, the team defended the name by saying it honored Louis Sockalexis, a Penobscot from Indian Island and the first known Native American to play professional baseball. He played for the Cleveland Spiders, the Cleveland baseball team that predated the Indians. “Sadly, the Cleveland professional baseball team only uses the story of Sockalexis to attempt to justify its use of the nickname and the racist image, Chief Wahoo,” Ed Rice of Orono, the author of “Baseball’s First Indian, Louis Sockalexis: Penobscot Legend, Cleveland Indian,” wrote in the BDN in 2016. By the time Cleveland retires its offensive logo in 2019, 71 years will have passed since its last World Series victory, which it won over the Boston Braves, whose team name and tomahawk logo remain alive and well in Atlanta and should also be revisited. Perhaps Cleveland’s late partial gesture of good will to Native Americans it has offended all these years will pay off in the form of a World Series victory. Or maybe not, and perhaps that’s what it will take to convince the club to also abandon its offensive name.